Republicans in Arizona are scared of the grassroots. That’s why they are pushing SB 1451, which would create burdens for people collecting ballot initiative signatures. The Arizona House Elections Committee will be hearing this bill tomorrow. SB 1451 has already passed the Senate, so our only hope is to stop this bill in the House. 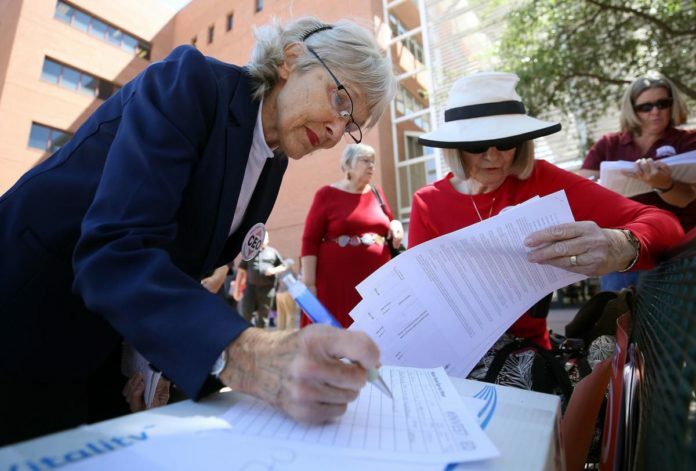 SB 1451 would require petitions to be identified and submitted by each signature collector, adding unnecessary bureaucratic hurdles to the already intensive process of gathering signatures to qualify an initiative. This is an attempt to once again weaken voters’ right to put ballot measures to a vote of their fellow citizens. Check out our call page for phone numbers and ask your state representatives to vote NO on SB 1451. Hello, my name is and I am a constituent of Representative from . I’m calling to express my concern about a bill that would undermine democracy in our state. SB 1451 would place onerous burdens on signature gatherers, . We should be facilitating access to ballot initiatives, not making it more difficult. Can I count on Representative to vote NO SB 1451in the House? Help us pack the hearing this afternoon! One of the most impactful ways to hold the legislature accountable is to show up in person.